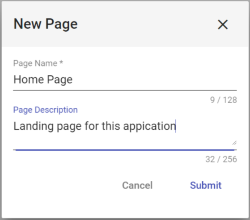 Pages can be used to create many things, such as: Application welcome or landing screens, about this application and help screens, and dashboards. An App Designer can access the Pages Dashboard, where they can create and edit App Builder pages, by clicking on the Pages icon from the left side navigator. The pages dashboard shows all available pages for the current application. An App Designer can create and update from here. Delete – Deletes the page from the application. Edit Page – Opens the page in the Page editor. You can also double-click on the tile to open it for editing. Page Name Enter the name of the new page. Page Description Enter a description for the form, help clarify its purpose.